I had a good ride down the A1 to the East of England Showground near Peterborough. Entering the showground was easier this year; normally there is just the main gate which is used by everyone. This caused tail-backs while all the bikes queued to get in and put on their wrist bands. 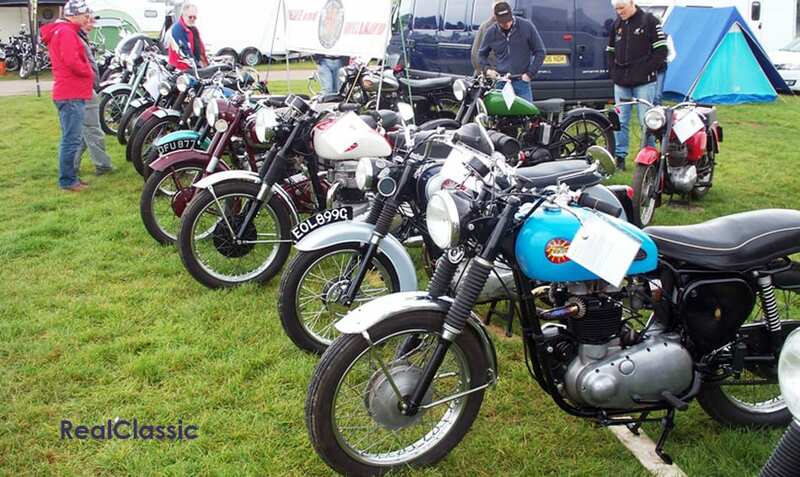 However, this year they opened three gates: one for those riders camping, another for people like myself who were displaying their machines on a club stand, and finally the normal entrance gate for the general public and also for exhibitors and deliveries. This gate was also used by riders taking out bikes on test rides. I was able to pick up a couple of show guides here, which were very useful to have with so much going on over the weekend. Six bike manufacturers had a choice of 55 different models to try out, and you could have great fun with all of these bikes. I quickly found Tri-Anglia Wheels, my sidecar club’s stand, where one of the ladies said that she had never felt that much heat coming off my engine! I certainly had enjoyed myself on the ride there. I then moved on to the Federation of Sidecar Clubs’ (aka ‘The Fed’) stand, where my outfit was to be on display for the weekend. The Hedingham Owners’ Club had their stand close to the Fed’s and they also had a nice display of outfits. 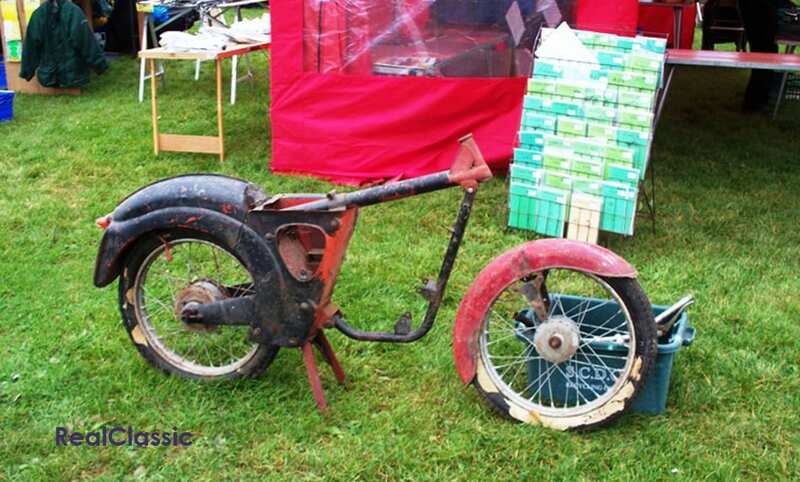 Opposite The Fed’s stand was a chap selling mopeds who seemed to have brought a job lot of Solex mopeds to the show. These machines have been around for years and are very basic, but they go quite well. The autojumble stand next to this one had a sign stating that ‘We buy Junk and sell Antiques.’ Probably very true! Amongst the ‘antiques’ was a Triumph sprung hub which could be useful to somebody. 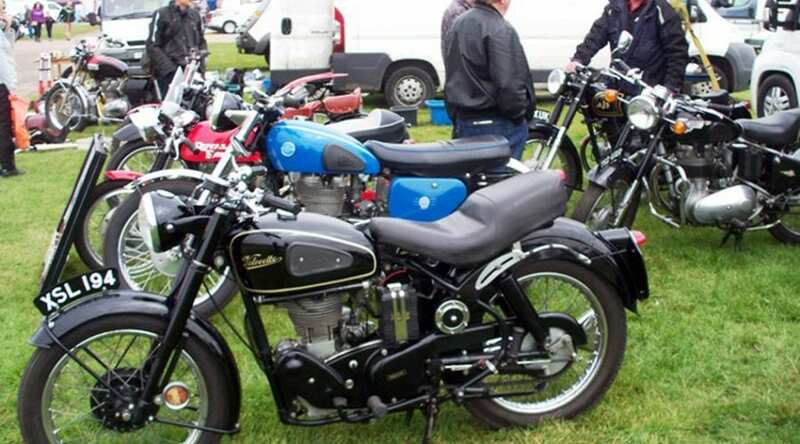 There was a good range of rider / owner club stands, with a stack of bikes from every era and all sizes of machines. The autojumble was mixed in with the club stands, which some people felt was better than a separate, designated autojumble area. 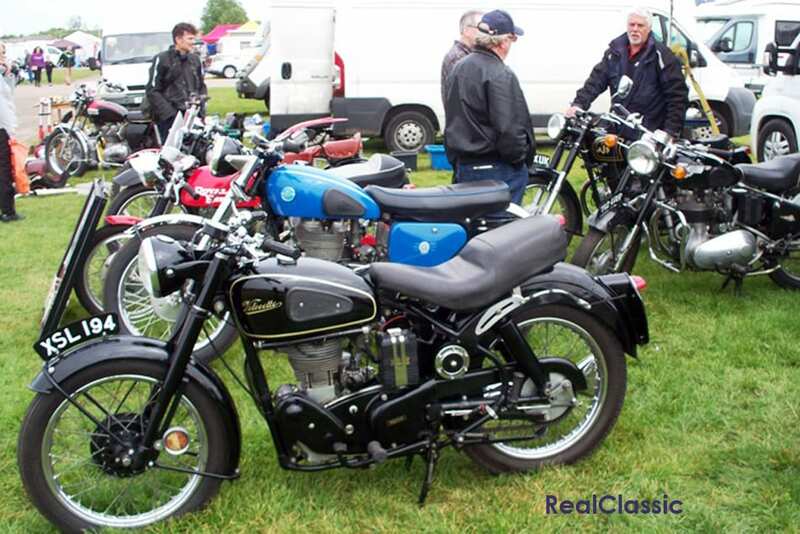 Browsing amongst the club stands I spotted the Nene and Welland BSA Classics Owners’ Club. I meet up with these guys three times a year, and they always put up a good display of machines; this year they included a racing sidecar outfit. Later I found the Indian Club stand; again a nice display. 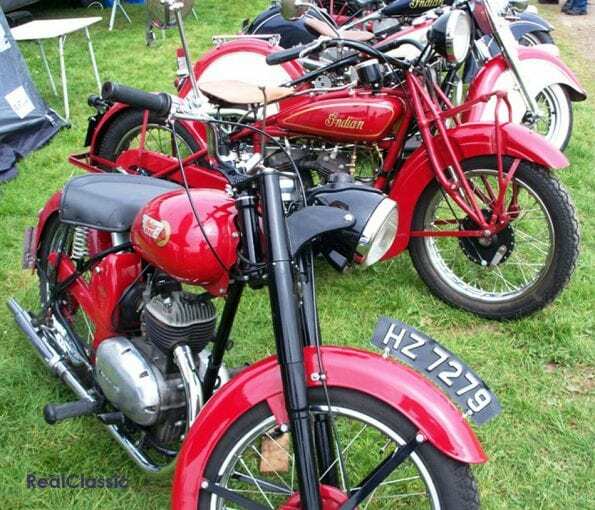 The bikes that interested me the most were two Brave models – these were made in England at Southport, by the Brockhouse Group who owned the Indian trade mark. 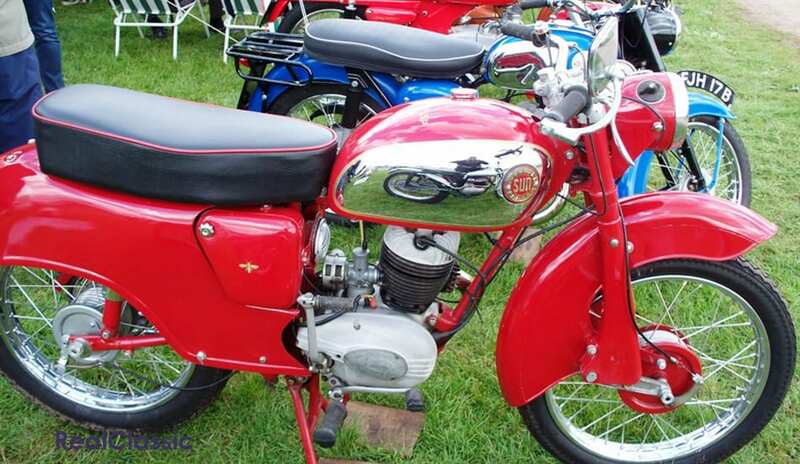 These models were fitted with 250cc sidevalve engines. Saturday and Sunday’s timetable was pretty full, starting at 9.30am with the Kevin Carmichael Stunt Show, with Steve Colley riding later. Also at 9.30am in the arena the DTRA and Hooligan racing took place; this is like speedway but a bit slower. This was really exciting, and talking to a steward he told me that there were several female competitors taking part in these races. Premier League speedway racing took place on Saturday evening, with the Peterborough Panthers taking on the Newcastle Diamonds. This event had free entry for campers. I was told that this was a very closely-fought match – especially the final which was a real wheel-to-wheel finish. Live music was available on Friday and Saturday evenings, with several bands, complete with a dance floor and a licensed bar. The exhibitors’ and trade stands covered a massive range of goods, with all the things you could want. At one clothing and helmet stand I spotted jackets reduced by £150; however they were still £200… Various companies offered holidays and tours, and one that I liked the look of suggested a ride from Los Angles to Chicago following Route 66. This is a 2800 mile trip – quite a ride. Wandering around, I came across some Ducati Multistrada and XDiavel motorcycles; these were Italian-registered and were used in the Ducati road / enduro course which was laid out in a field. The instructors were Italian but spoke good English, and this course proved popular. On another stand I spotted the remains of a 1956-ish James Comet or Cadet; this consisted of the frame, rear mudguard, rear suspension unit and a front wheel. My interest in this was that my first motorcycle was the 1956 Comet model. 98cc and two gears; gear change was on the handlebars, and all of 2.8bhp, but it was definitely better than my push bike! Later on I noticed that the James had gone, and the trader told me that he had sold it for £75. There were loads of food outlets, with plenty of choice. One pasty stall, close to the Tri-Anglia Wheels’ stand, did very well; they even sold out of their largest pasties, mostly to the Wheels’ members! They were very, very good! The helmet park was very busy. Close by was a line of racing motorcycles which were advertising the Brackley Festival of Motorcycling which will be held on 13th August this year – this looks to be a good show. GetOn.co.uk had a good set-up for people who had not ridden at all or very little, providing taster sessions on 125cc machines. Four trainees were sitting on their motorcycles, and the two instructors had their work cut out running up and down the training area and getting the pupils to stop before they hit the barrier fence! The firm supplied machines with low seats, making it easier for the pupils to put their feet down. 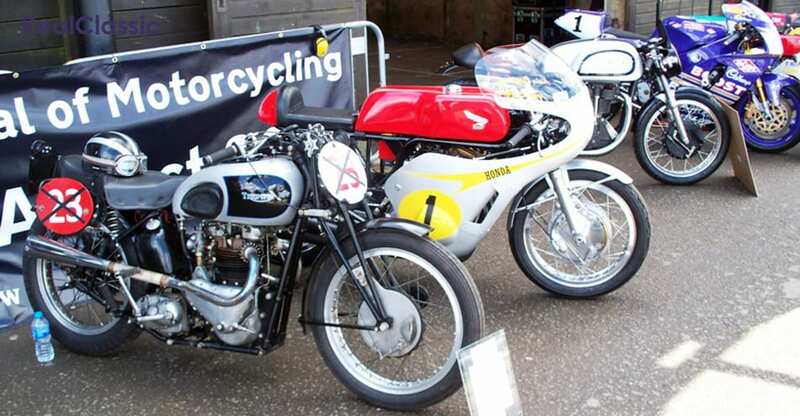 In another hall, British Mini Bikes were on display; it is claimed that this is the fastest growing grass-roots bike racing championship in the UK. They say that kids can race from the age of 6 years old, the senior class is from 15 years and the veterans are over 40. This is a really good show, with plenty of classics to look at, and I feel that you would need to be there early to see it all in one day. Luckily I was on a club stand so I had the whole weekend to enjoy myself. Next year there is already a space in my diary to come here again.